When Tim and I first started spending serious time together at the condo, he pushed for a proper TV. I had resisted having one for quite a while. As a singleton, I certainly watched my fill of Netflix, Hulu, Amazon prime on my little laptop, so it’s not out of snobbery. I guess I just didn’t like the looks of them. 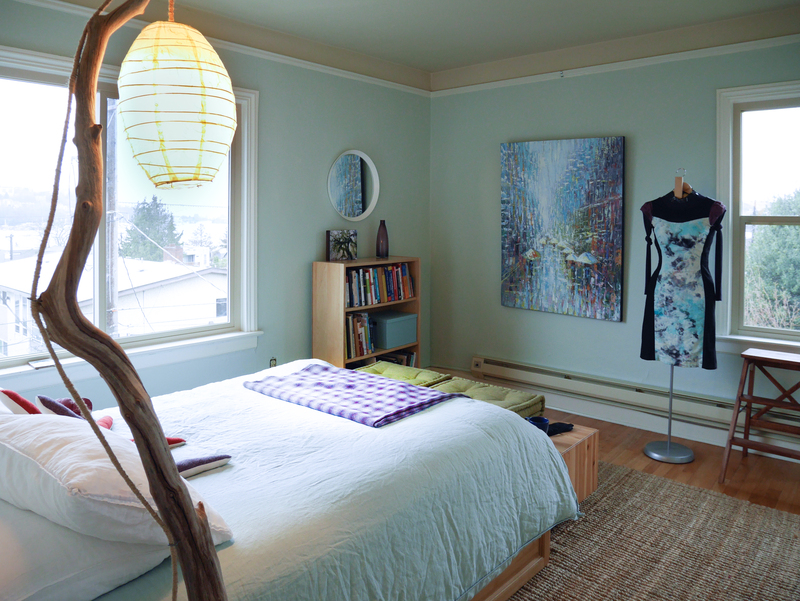 Even the modern flat screen versions come with a clutter of cords, and when turned off their black screens still command attention in a room. However, Tim is keen on ergonomics, and even I can see their value when it comes to watching a movie together on the couch. So I agreed to buying a reasonably priced, midsize flatscreen TV, with the stipulation that Tim make us a TV cabinet. 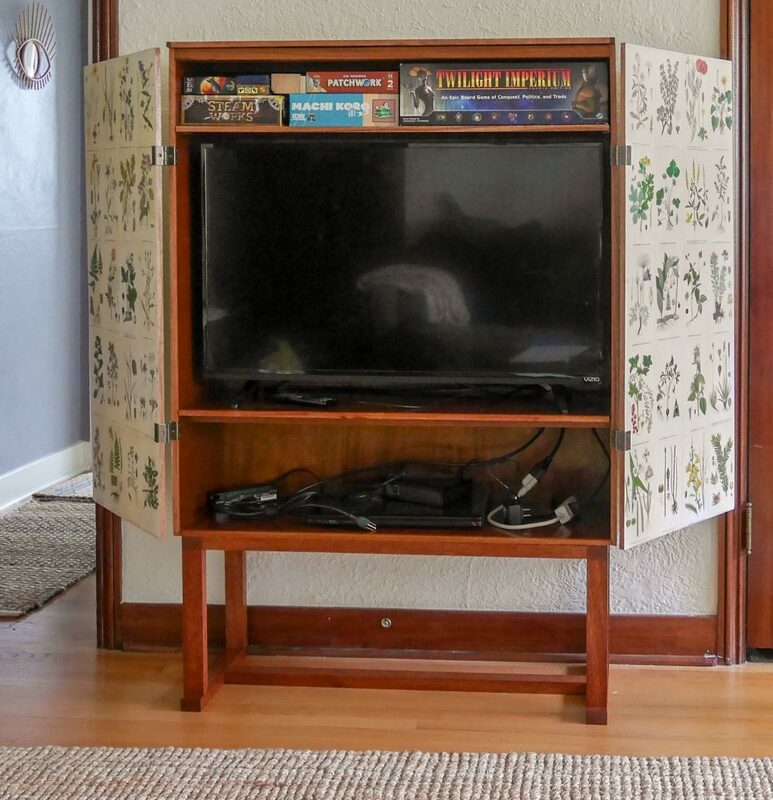 And not just any TV cabinet. 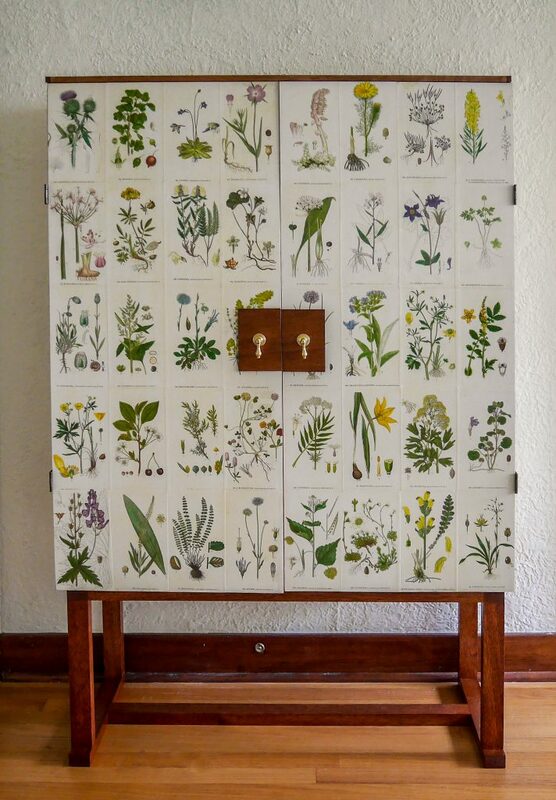 The prettiest TV cabinet I could conjure. When I saw it scouting around Pinterest, I knew this was the one. 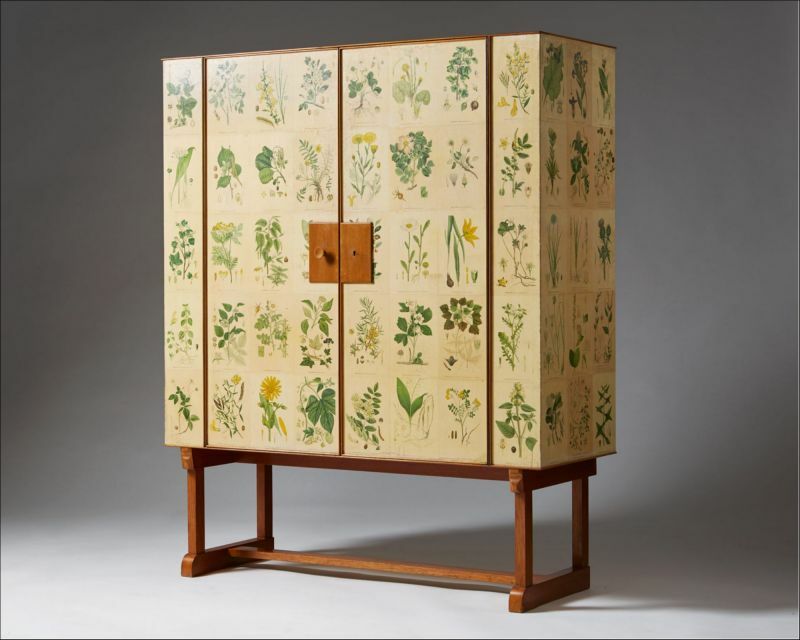 This cabinet is a classic mid-century piece by Austrian turned Swedish architect, textile designer, and furniture designer Josef Frank. It’s a fairly simple box design, made out of mahogany and decoupaged with the pages from an old Swedish botanical print book, Norden Flora, by Carl Lindman, circa 1901-1905. I’m not sure how many of these cabinets were made back in the 1940s-1950s, but the antique versions are highly collectable and highly expensive. I found one on First Dibs for the bargain price of $90,000. Of course, First Dibs is astronomically priced even for collectables, but even if it is worth half of that, it’s still a ridiculous sum. We could do as well for far less. 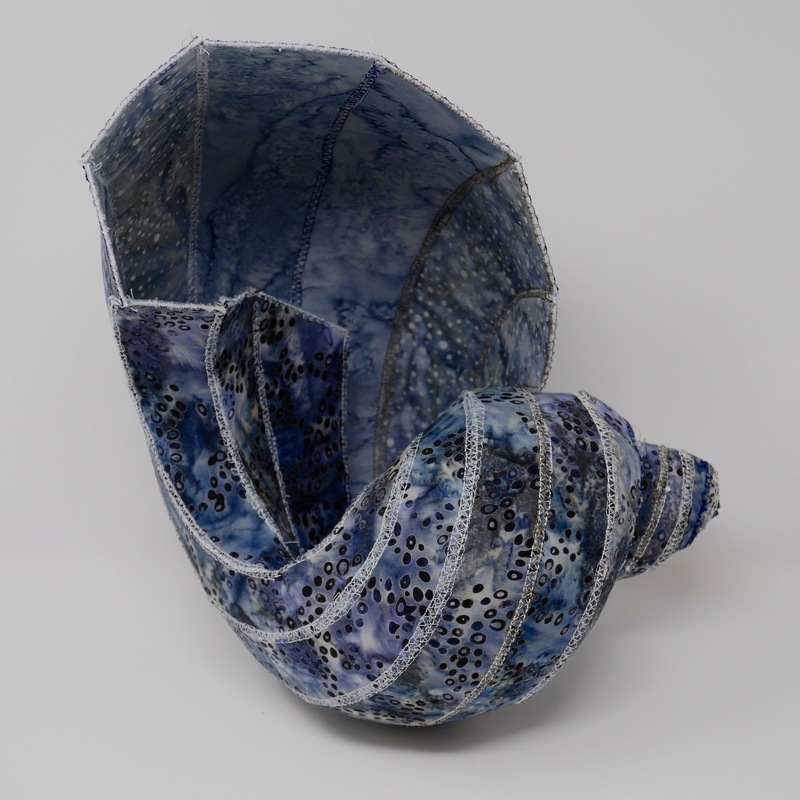 I was also compelled by the decoupage. 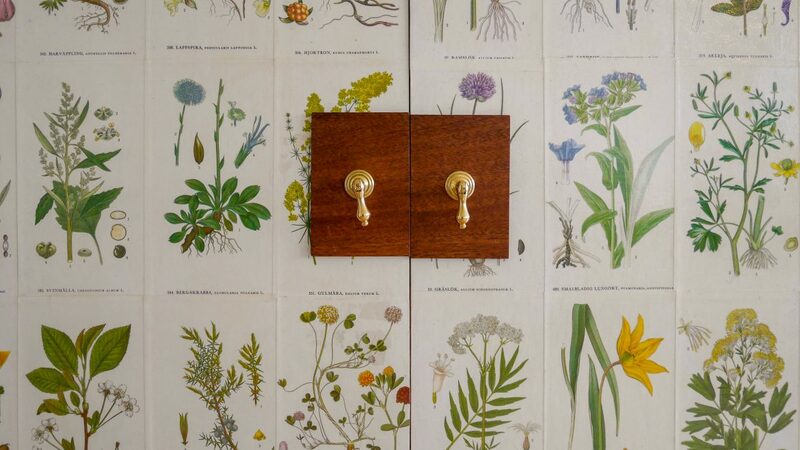 Decoupage is basically the craft of cutting up paper images and glueing them to wood, then sealing them. This cabinet seemed like the most elevated version of the craft that I had ever seen and I was up for the challenge of giving it a go. 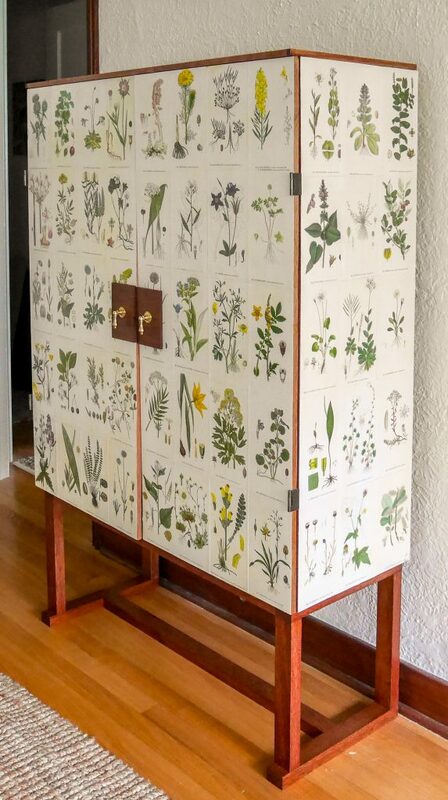 Not only am I a sucker for botanical prints, I knew that the cabinet would fit right into my 1928 condo living room, with its cream colored walls and mahogany doors and trim. 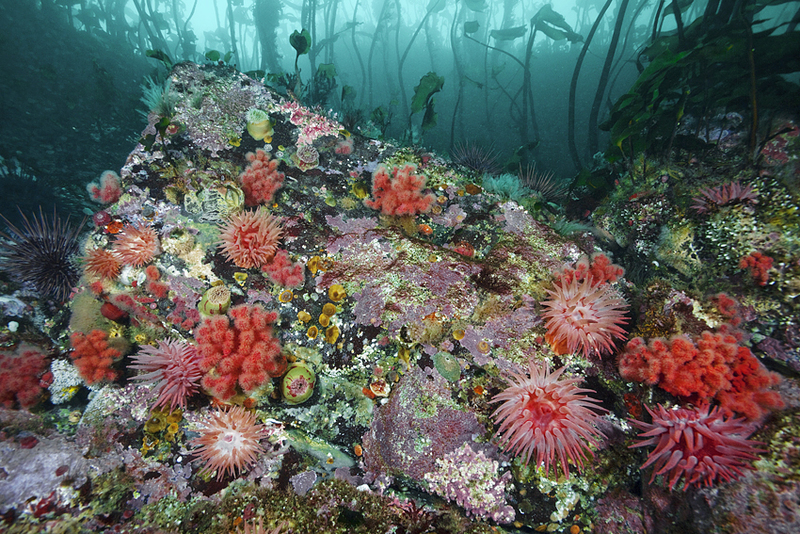 It would stand out as an art piece but also not dominate the entire room. A few requirements: the doors needed to fold back so that we would have unencumbered viewing. We needed to have room for electronics on the bottom shelf: a dedicated laptop for Nextflix, Tim’s external hard drive, and any other accessories. We also needed a top shelf for our board game collection. 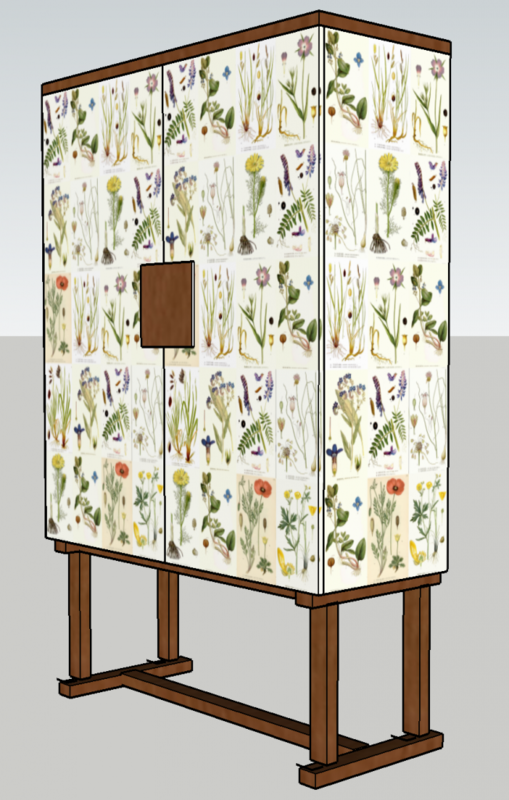 I did a few designs in Sketchup of our version of the Norden Flora cabinet. 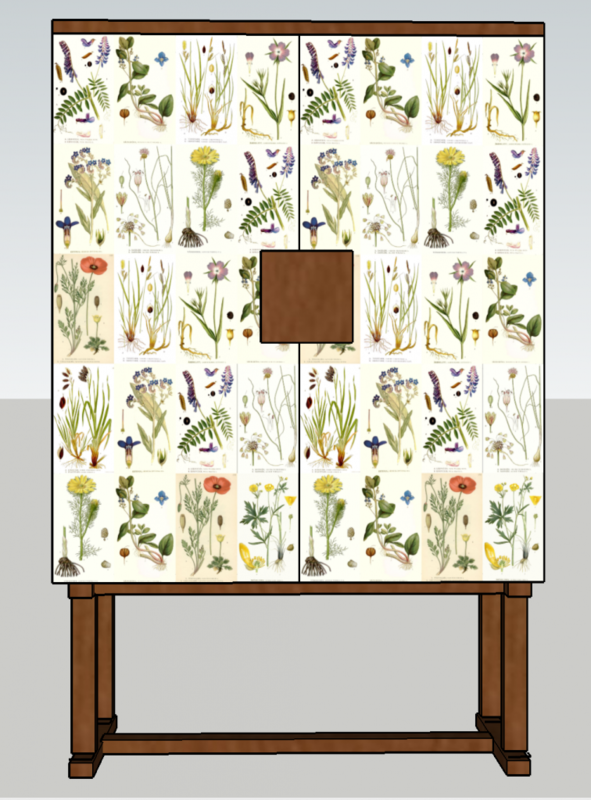 Ultimately, our rendition of the cabinet was not an exact replica of the original, but certainly has the same spirit. Tim deserves all of the credit for the beautiful construction. 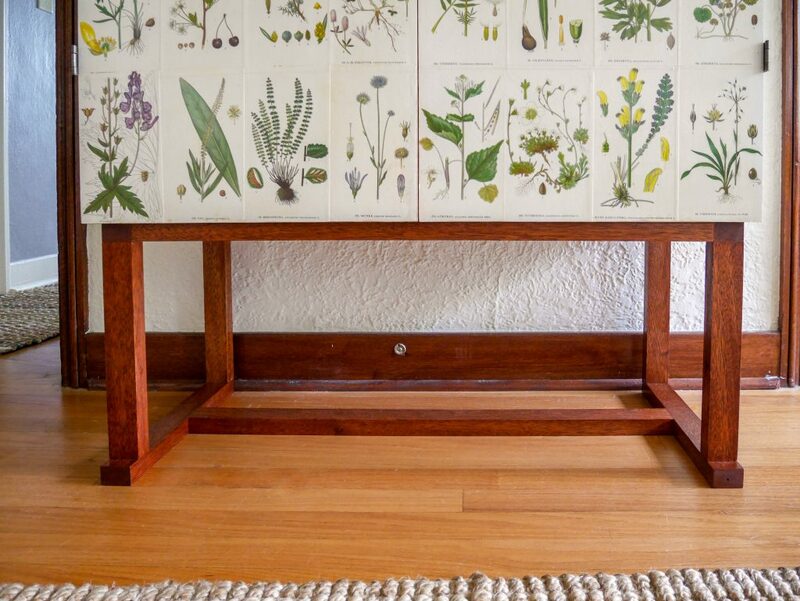 Tim built a frameless cabinet out of khaya mahogany plywood trimmed with hardwood khaya. Just making sure everything is squared up in the cabinet box is both completely necessary and non-trivial, especially when dealing with wood, which can get out of whack just by changes in humidity. Tim taught himself many woodworking techniques to achieve flush edges, square fitting pieces, and sound, stable construction. The doors are the tiniest bit warped, although Tim assures me we might be able to get to them to lay completely flat with the right door catches. As far as the decoupage, I managed to find on Etsy a reprinted copy (circa 1974) of the complete 10 volume set of Norden Flora. I adhered the pieces with everyone’s favorite medium, Mod Podge, and sealed the adhered pages with 4 coats of the same. 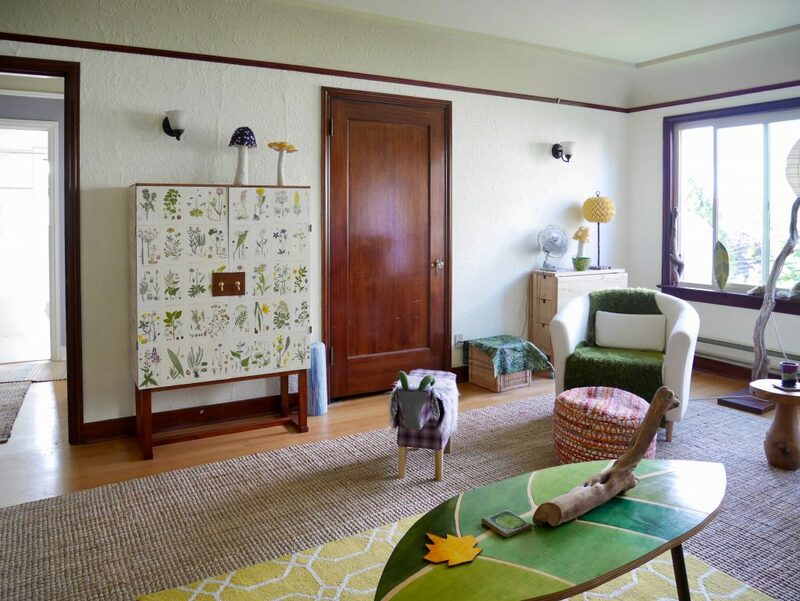 Since the pages we used were quite a stark white, I wanted to achieve a more antique yellow paged look that would be more faithful to the inspiration cabinet and work better with the walls in the room. To achieve this, I mixed up some blond dewaxed Shellac and brushed a few coats over the sealed paper pages. 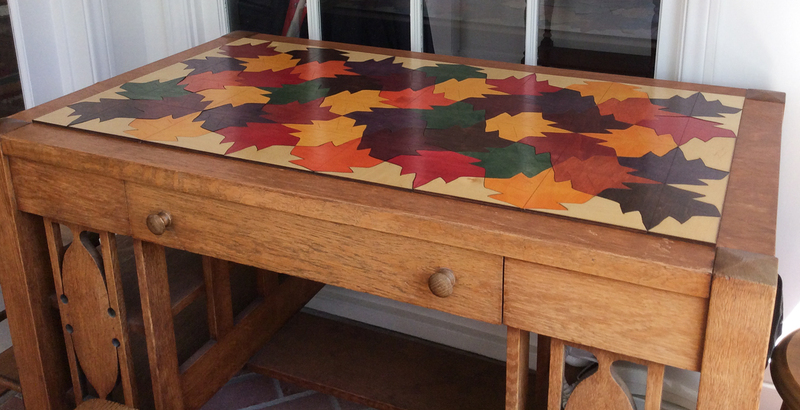 (Note, if you want to try this at home, it is crucial that you seal the paper thoroughly before applying shellac, otherwise it will make unsealed portions turn translucent). We used an awesome oil-based stain (color was Candlelight) by General Finishes. For the base, our favorite wood supply store, Crosscuts, had a sale on milled meranti, which we thought we could make work for the base. I mixed up a crazy “Frankenstain” of different stain colors to try to match the base to the mahogany on the rest of the cabinet. Since I used stains from a few different brands, the stain ended up congealing into a disgusting texture, but it still worked color wise. After staining, the cabinet interior and base were coated with a protective coat of oil-based polyurethane. 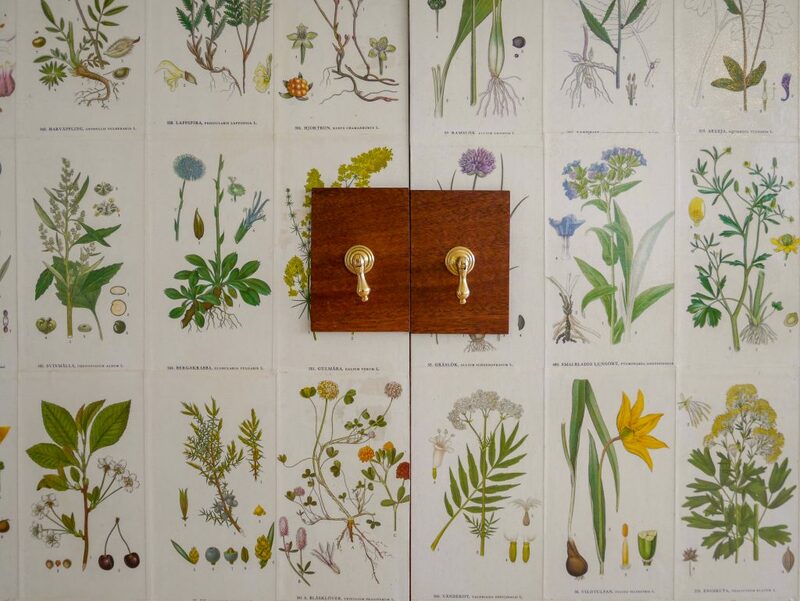 We sourced the door handles from Hippo Hardware in Portland–they are beautiful drop pull handles in brass. As far as its functional side, I’m pretty sure we nailed the brief. Here’s the open cabinet and the upper game shelf and lower shelf for all the electronics and cords. The best part about it for a cord-a-phobe like myself is that the TV is fully plugged in through a hole in the back of the cabinet and there are no visible external cords! Sometimes you get a new piece of furniture and it seems to stick out like a sore thumb until you get used it. But this guy fits into the room perfectly. Welcome home!